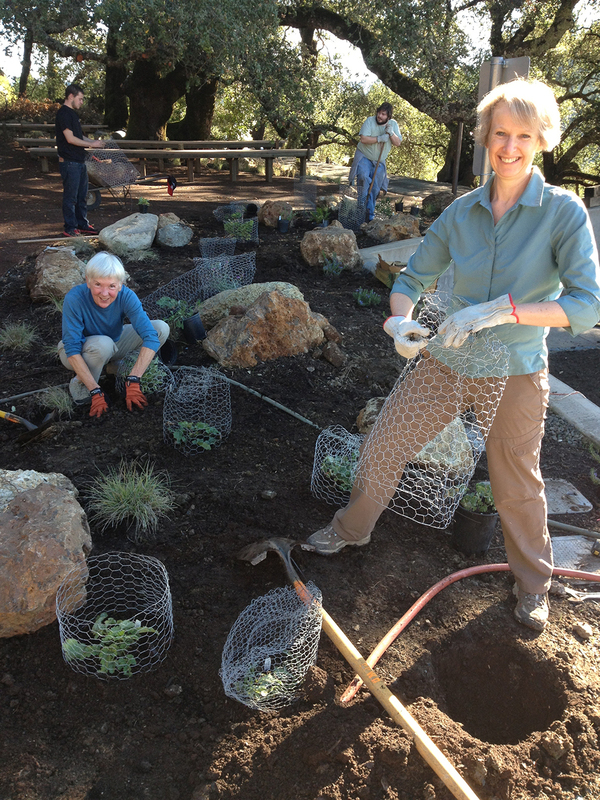 How long have you been a Steward, Tracker, or Volunteer with Pepperwood? 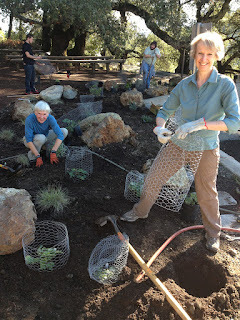 I started volunteering about four years ago and then became a steward last summer, after going through the Bio-85 program at SRJC and becoming a California Naturalist. Tell us a little bit about your background and how you became interested in Pepperwood. What keeps you motivated? I grew up in the New Forest in England, so my backyard as a child was an ancient 1000-year old forest where the local ponies and donkeys had free rein to wander wherever they liked. There wasn't a lot else to do other than spend time in the woods, heathland and streams, so I became very comfortable outdoors and a love of nature and a desire to take care of the environment grew from that. As a teenager I became a member of the British Trust for Conservation Volunteers and spent my summers restoring wetland habitats and scrub-bashing (removing invasive species) near Stonehenge. I then went to college and majored in biology, but meandered into healthcare rather than my favoured field of ecology. A few years have passed since then, bringing me to Sonoma County. 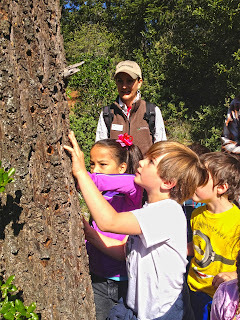 Luckily, I discovered Pepperwood in 2011 when I brought my son, Peter, up here for a field trip for a summer SRJC class; as soon as I arrived, I decided that I needed to spend as much time as I could at the preserve. Every time I drive through the Pepperwood gate, I'm reminded of why I made that decision. I enjoy helping with the community events like the lectures, classes, hikes, gallery exhibits and the wildflower festivals. The volunteer workdays have given me the opportunity to help with the creation of the demonstration garden and the gathering ground. I've also been involved with the Phenology Project for almost two years now, where a group of stewards and trackers monitors plants twice weekly to see which life cycle stages they are exhibiting, such as leafing out, flowering, producing seeds, etc. My favorite part of the Phenology Project has been the group of oaks which I have been monitoring for the last year. I have learnt so much about these plants, and oaks in particular, through doing this project. I've also helped with the fieldwork for other climate change projects like the Terrestrial Biodiversity Climate Change Collaborative (TBC3)'s 50 woodland plots, some of which are located in the less-visited parts of the preserve, giving me a great opportunity to explore Pepperwood in more depth. What are three words that describe Pepperwood to you? What does your experience at Pepperwood mean to you? 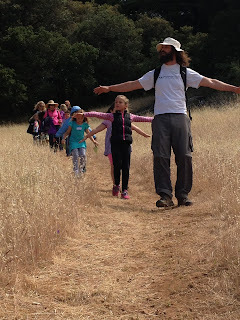 Being surrounded by the gorgeous Northern California landscape, with the grasslands, oak woodlands, and the redwoods, puts everything in perspective for me and brings balance to my life. Additionally, I really appreciate the community which the preserve attracts, the staff, the scientists, volunteers, and visitors, who all seem to value the landscape and care about protecting the environment. It's been especially rewarding that my sons have found a good niche here, too, with Sam spending a wonderful summer here as an intern and going on to study ecology, and Peter thoroughly enjoying the first TeenNat program. Wendy in the field at a Volunteer Workday. What’s the most surprising thing you've learned or seen at Pepperwood? I was surprised to discover that I was brave enough to hold a snake during a Bio-85 reptiles and amphibians class. It was only a little gopher snake, but that was pretty amazing. One of the most beautiful things I've seen was a huge King Snake stretched out across the trail. What’s the one thing you’d want to share with someone who is thinking about volunteering? There's something for everyone here, whether they want to enjoy the outdoors, work on a computer or at public events, take part in science projects, learn more about plants or animals, tend a garden, pull out invasive plants or even love to cook, and the community is so welcoming. I like to spend time with family and friends, as well as enjoying all that Sonoma County has to offer, such as hiking, art, local good food and wine, and traveling further afield to Yosemite and the UK when I get the chance. --- Interested in volunteering? Check our website for more information. visit Pepperwood. Photo by Sandi Funke. 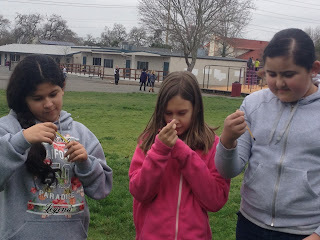 Pepperwood year-long environmental education program for area elementary schools, SCENIQ (Students Conducting Environmental Inquiry), has recently qualified for Sonoma County's Upstream Investments Portfolio at the Tier Three level for Innovative Practices. The Portfolio of Model Upstream Programs is a collection of local evidence-based programs proven to help eliminate poverty in Sonoma County and ensure equal opportunity for quality education. Programs included in the Portfolio have completed a rigorous application and review process to demonstrate a solid basis in research and a commitment to program evaluation. Pepperwood Foundation’s SCENIQ program is an innovative conservation program based on best practices that promotes lifelong environmental stewardship. The mission of Upstream Investments is to promote effective and prevention-focused approaches that will ultimately uproot poverty and reduce monetary and societal costs to our community. The Portfolio of Model Upstream Programs is a collection of evidence-informed programs. Programs undergo a rigorous, iterative process to join the portfolio. Programs are listed as Tier 1, 2, or 3 depending on where they are in the process and the type of program. Pepperwood’s application to Upstream Investments engaged the expertise of not only Pepperwood staff but our Education Advisory Committee as well as technical advisers from Upstream. Funders are using the portfolio to guide their investments. during a visit by Pepperwood educators. Photo by Sandi Funke. “I am very excited that the SCENIQ program from Pepperwood has been included in the Upstream Investments Portfolio. For many of my students, their participation in the SCENIQ program is their first and most extensive foray into the natural world,” said Doug Day, 5th grade teacher at San Miguel Elementary School in Santa Rosa. Pepperwood’s SCENIQ program provides the community’s diverse youth and their families with the knowledge, motivation, and skills to get outside and enjoy exploring nature, not just during their visit to Pepperwood, but over their lifetimes. Educators pique students’ curiosity and excitement and inspire a long-lasting appreciation for the natural world. This is accomplished by teaching schoolchildren fun, hands-on, nature observation skills they can apply in their communities and having them practice these skills at Pepperwood. hike at Pepperwood. Photo by Sandi Funke. SCENIQ includes a four-hour hands-on, science-based field trip in the fall, a one-hour classroom lesson in the winter, supplementary teacher-directed lesson plans, and a follow up four-hour field trip in the spring. The program utilizes bilingual English-Spanish nature journals customized for each grade level with illustrations of local plants and animals by artist John Muir Laws. Over 800 students participate in SCENIQ each year from schools in Santa Rosa, Calistoga, and Healdsburg. Pepperwood prioritizes serving classes from Title One schools and provides bus transportation scholarships to enable their participation. Interested in supporting Pepperwood's SCENIQ program? Click here to make a donation.